this 5 days lake mburo and bwindi safaris brings forth two distinct aspects which is wildlife safaris at lake mburo national park and gorilla trekking at bwindi impenetrable forest national park. Early in the morning , depart by road to Lake Mburo National Park(the drive will take approximately 3-4 hours). You will have a stopover to look at the Royal Drum makers, stand at the Equator for a photographic opportunity and also listen to some few interesting facts. We will continue to Lake Mburo National Park. This Park is an extension of the Tanzanian plains with big herds of zebra, impala, eland and other ungulates. Bird viewing opportunities are excellent – for birders, this is one of the best places to find African fin foot, papyrus bush shrike. After checking in, you will take a guided nature walk. This walk takes you to the Salt Lick Area. A strategically located wooden platform (Observation point) offers a chance to see at least four different species of animals at any one point while they lick the salty soil. Return to the camp for lunch, after which we will continue on your journey through Kigezi highlands which offers excellent views including the triangular peaks of the Virunga volcanoes of Rwanda and the Congo. The road then drops down into a valley of Bwindi Impenetrable Forest National Park, home to the Mountain gorillas! Wake up relatively early for a heavy breakfast to give you the energy needed for gorilla trekking. Before 8:00 am report to the ranger station for registration and a talk by one of the rangers; the guides will then take you through the bush pushing your way through the undergrowth, parting thick creepers, to track the gorillas. (This trek can take from half an hour to 5 hours – a reasonable degree of fitness is required as well as a sturdy pair of walking shoes) Sit in the forest among the gorillas, listening to them grumble to each other, and marvel at the sheer size of the dominant male; the silverback. It is an extraordinary feeling sitting in the dense rainforest knowing you are with a few of the last remaining mountain gorillas. It’s amazing to think there are only about 650 of these beautiful creatures left! If you have the energy this afternoon, take a guided walk on the Munyaga River trail, which is an ideal short walk. This trail leads to three delightful crystal clear waterfalls, and there is a profusion of tree ferns, epithytic ferns, orchids and Bwindi’s colorful array of butterflies. Here you may also see birds and primates from the forest edge. OR If you have the afternoon free, how about a guided village walk – see how the Ugandans live! After a morning breakfast, we will drive back to Kampala stopping en-route for lunch arriving in the early evening. On arrival in Kampala, your safari guide will transfer you to your hotel. If you have energy, your guide will take around the African Craft market where you can buy Souvenirs for your self. Your safari guide will collect you from your hotel and transfer you to Entebbe International Airport for your outbound flight. Trekking Gorillas preferably the silver backs and their families in Bwindi National Park is the foremost tourist attraction while on a uganda safari, and possibly the best wildlife encounter in the world. Here half the world’s population of Mountain Gorillas live in this most diverse rain forest ecosystem. There are other primates here as well; Chimpanzees, Black and White Colobus Monkeys, Blue Monkeys, Grey-cheecked Mangabey and L’hoest’s Monkeys. In addition, there are 350 bird species, 200 butterflies, 27 species of frogs, 163 species of trees and 100 species of ferns. Bwindi has been designated by UNESCO as a World Heritage site; the 3,315 square meter park has 4 tracking trails, one leading to the highest peak, Rwamunyonyi at 2,607 meters in elevation. These trails, also provide access to the many other attractions of the park, such as rivers, waterfalls, swamps – all with a high level of wildlife concentration throughout. Lake Mburu National Park is less than 400 square kilometers in size, but is diverse in terms of the various ecosystems that exist within its boundaries; dry hillsides, swamps, rocky outcrops, bushy thickets, open and wooden savannas and forested areas. It proximity to Kampala on an excellent tarmac road, makes it accessible to many. 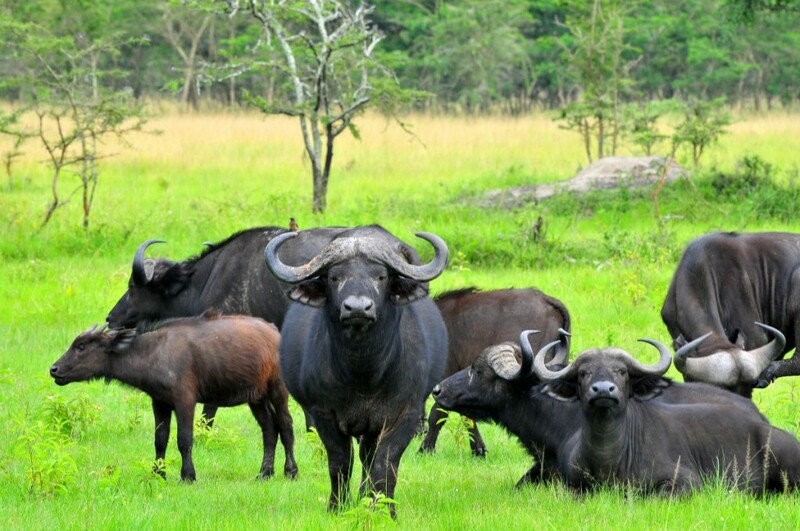 There is a wealth of wildlife in Lake Mburu National Park. In terms of activities, there are Game Drives, boat trips on the lake itself, visits to the Salt Licks, trails through the Rubanga Forest and the Conservation Education Center, where there are educational talks presented regularly.